Texts by Anneka French and an in-conversation between the architect Glenn Howells and Sven Bergelt. The catalogue "Future Worn Out New One" is a documentation of a site-specific installation by Sven Bergelt. Created during his three month residency in Birmingham at Glenn Howells Architects. The residency was part of exchange@2015.le an artist exchange programme between the sister cities of Leipzig & Birmingham, as part of the 1000 year birthday of the city of Leipzig. The exchange programme was initiated by Leipzig based arts organisation Halle14 in partnership with Birmingham based arts organisation WERK & Glenn Howells Architects. In ‘Future Worn Out New One’ Bergelt deals with the urban development and the visual image of Birmingham. His installation was exhibited in the office of Glenn Howells Architects. The catalogue is made up of photographic documentation of the work and is accompanied with an introduction by the art critic Anneka French, as well as an in-conversation between Bergelt and Glenn Howells. Furthermore a supplement in the book documented the second version of the work "Chapter II: Re-construction" that was presented in the Halle14 in Leipzig. An exciting opportunity has arisen within a pilot initiative to appoint a part time freelance coordinator to develop long-term procedures and processes that aim to enable and facilitate future events and activities to take place in Longbridge open spaces. Longbridge Public Art Project (LPAP) and FLOS will support the coordinator with working experience of the area, and existing cross sector partners to assist in identifying processes and procedures that are required to enable a wide range of community and youth-led activities to take place all year round in Longbridge. Friends of Longbridge Open Spaces (FLOS) aim to facilitate the utilisation of open spaces and venues. The FLOS group was established as part of LPAP long-term objectives to support the regeneration of the area through social, historical and cultural activity. FLOS is made up of representatives from Longbridge organisations and businesses to support community and youth-led activity to take place in the area. Please join us for the opening of LPAP artist-in-residence Cathy Wade’s in progress exhibition. During her LPAP residency Cathy Wade has researched physical remnants of Longbridge’s heritage, ecology and lighting, and explored the potential for Longbridge to retain its industrial past as well as the creation of new gateways to the development, come and join us in the LPAP temporary project space to find out more and how you could get involved. The opening will include a tour at 6.45pm led by the artist around Longbridge of the ‘Star Map’ installation and new lighting & planting scheme she has created with St Modwen for the town centre. Please wrap up warm and grab a bag of chips from Queen’s Fish & Chip shop for the walk! As part of this on going in progress exhibition Cathy Wade will be launching the next phase of her LPAP work ‘Wild Longbridge’. This is in partnership with IncrEdible Longbridge by Northfield Ecocentre to collaboratively explore how planting, growing and eating can be a shared activity used to enhance the built and social environment. Pop into the LPAP | SPACE to find out more! Leipzig based artist Anna Schimkat was commissioned as part of Longbridge Light Festival in 2014. The artist developed new work for the festival, meeting local people and exploring Birmingham’s cultural offering and art community. Anna spent her time observing the daily activity at Longbridge Train Station, becoming particularly focused on the rhythm of people moving through it. Her preoccupation with the experience and sensation of space lead her to create two site-specific sound works that capture the patterns of transient occupation that are so familiar in suburban train stations. 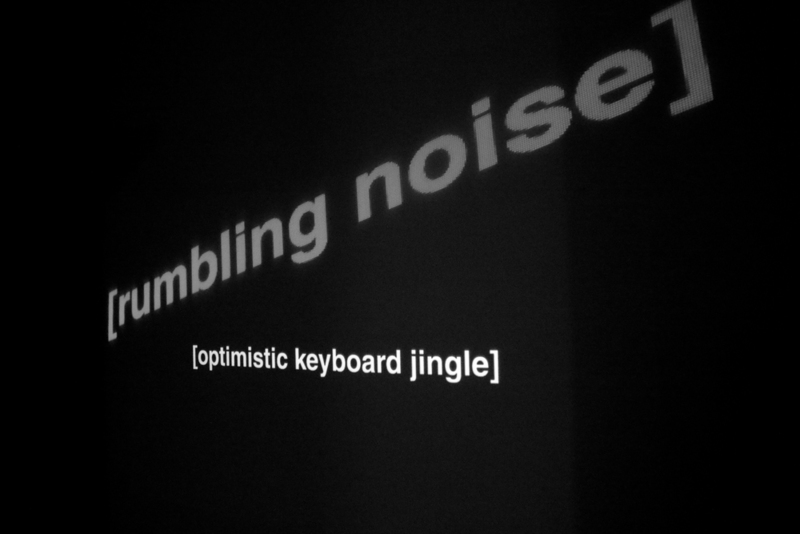 She experimented with recording noise at the Train Station to create interactive soundscapes that were heard throughout the station on the night of the festival. Anna will be returning for Longbridge Light Festival 2016 and is collaborating with Bobbie Gardiner to create new work, more exciting news to follow! The mini restoration project is part of Longbridge Public Art Project (LPAP) by WERK. LPAP is a five-year contemporary site specific art project that includes a long term artist residency and community engagement programme at it's core, and is embedded within one of the largest regeneration schemes (St. Modwen) in the UK. The project is generously supported by The William A. Cadbury Charitable Trust, and is exhibited as part of British Art Show 8. The Film is made by Robert Beske | shrine productions. Stuart Whipps has a long history of working with the Longbridge site. Since 2004 he has been making photographic works that have probed its changing physical, social and political nature and his work as artist in residence at LPAP continues this research. In one of his most ambitious projects to date, Whipps is restoring a 1275GT Mini made at the plant in 1979 with the help of several ex-employees including Keith Woodfield, whose time and insight is proving invaluable. Many of the processes of stripping down and replacing or repairing the parts can be seen in a glass-fronted cabin-come-workshop in the carpark of Bournville College, as well as various galleries across the country as part of Whipps’ participation in the touring British Art Show exhibition. The (dis)assembly of the Mini provides a parallel to the cyclical changes experienced by Longbridge itself, for, after a long period of demolition and emptiness, new opportunities and facilities are emerging. 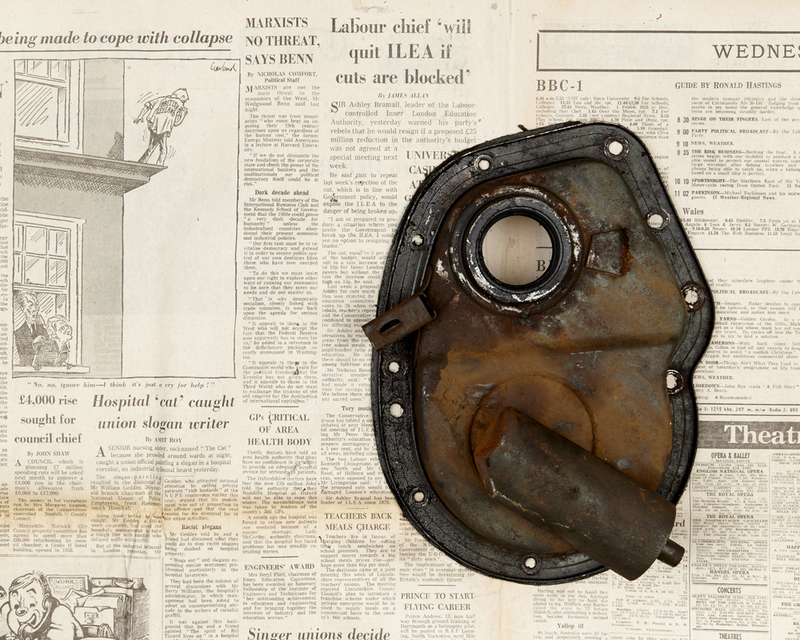 The display of the car in various states of repair showcases the significance of this particular part of British manufacturing heritage to a wider audience. Individual car parts have been photographed upon removal from the chassis, in a kind of ‘forensic examination’ of the car, as Whipps describes it. Supporting these parts, in the background of the photographs, are what appear to be ordinary sheets of newspaper. In fact, these pages depict political cartoons from the national press in the watershed year of 1979. In this year Longbridge trade unionist Derek Robinson, known as ‘Red Robbo’, was dismissed after almost forty years at the plant, shortly after Margaret Thatcher came into political power. She described Robinson as a 'notorious agitator’. These political threads run throughout Whipps’ work for LPAP. Indeed, his project is titled ‘The Kipper and the Corpse’, a line that makes reference to 1979 episode of ‘Fawlty Towers’ in which Basil Fawlty jokes about strikes at Longbridge. Near to the workshop where Whipps has been working will soon be a pedestrian tunnel under the A38. The artist has designed a number of permanently-sited artworks that will enhance this new public walkway. Like Wade’s permanent works, Whipps’ designs will incorporate elements of Longbridge’s past. A chronological presentation of every body work paint colour produced at the plant will appear on steel barriers that will separate the tunnel archways from the River Rea, combined with an enlarged, distinctive hounds-tooth pattern used in the interior upholstery of cars manufactured at the plant. This will be a timeline of changing taste and aesthetics, manufactured with contemporary technologies and materials. A lighting system designed by Whipps within the tunnel will provide a practical function while illuminating various key features of the Grade 2 Listed tunnel structure. Stuart Whipps will be holding an 'In Progress' exhibition of his work created as part of LPAP on the 13th March at Greenlands Select Social Club, Longbridge. The exhibition will be made up of photographs, films, research material and of course the shell of the 1979GT Mini that the artist has been restoring with the help of former employees of the Longbridge Car Factory. Stuart will also be exhibiting the shell of the car as part of the 'Mini Fair 2016' on the 31st January at Bingley Hall in Staffordshire organised by The Mini Club magazine. Chuck Palahniuk, Invisible Monsters, 1999. The bodies we inhabit are not impermeable; they do not come into the world packaged with assurances of forever. We accept that with time our body will degenerate and breakdown. We hope that this will happen at a remote point, as if our mortality is on the horizon, signposted somewhere just beyond our focus. We don’t have to look for signs. In a doctor’s surgery is a poster for HIV/AIDS awareness; the patient is told: ‘Look behind you, this is you now’… This is what he became when he was informed of his bodies’ inhabitation by an incurable virus. For the generations brought up with the discovery of HIV/AIDS, its symbolism was depicted by images of the deathbed, the tolling bell and the tomb. The emaciated body, the vials of blood, the shock that Oliviero Toscani used to sell you jumpers by Benetton. 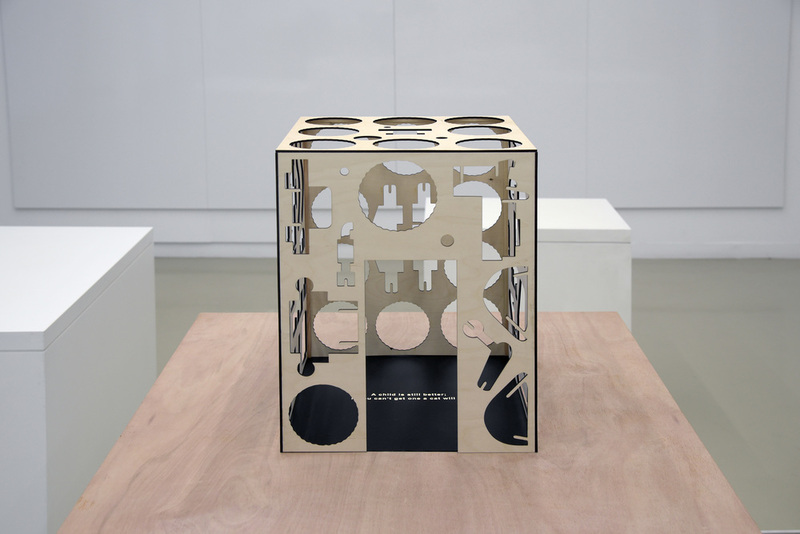 Strategies were engaged by artists that articulated ideas beyond these narrow parameters. General Idea’s AIDS (A Project for the Public Art Fund, Inc.),Derek Jarman’s Blue, Karen Finley’s Written in Sand and Felix Gonzales-Torres’ Untitled (Perfect Lovers) brought a humanity to picturing AIDS/HIV. Time brings transformation. Time has brought medical breakthroughs and better drugs. It has brought with it adherence to medication schedules that render the virus undetectable within the body, and life expectancy projected at near normality. The conversation we have about HIV/AIDS needs to refocus on life not death, challenge preconceptions and address nuances of language and symbols. Throughout Ian Richards’ residency at HALLE 14 his work has been built around extensive research into the current life experiences of HIV+ people. The artist has elicited responses through conversations with populations in Leipzig, Birmingham and gathered research from worldwide participants. The work he has developed is now reinserted back into the public arena – the city of Leipzig through billboards, site-specific text, and distributed as postcards, hand-stamps and tote bags to form oblique poems. Acts of disclosure from HIV+ people on fallibility, infection and the future are placed site specifically by Richards, the work public yet opaque. This space between knowing and unknowing will open up other readings; in the work Unprogrammed | Programmed: Please take a seat in the waiting area (2015) the text sited at the bus stop will build its own relationship with the world from the HIV+ man who travels from it to his clinic. Here the link between diagnosis and daily life is underlined as a routine, a continuum. In the video Undetectable | detectable: Don’t die of ignorance (2015) the image and soundtrack from the 1986 British public information campaign is removed, leaving subtitles to describe the psychological impact of the advert that heralded an apocalyptic monolith for AIDS. The resulting text is then projected onto an amended songsheet, in which the Irving Gordon classic Unforgettable takes on new form as Undetectable. This act of layering reveals the complexity and depth of the work, and articulates the shifting conditions of this subject. Work made by Richard’s since his return to the UK has focused on the binary nature of diagnosis, in the work Unfold / fold: Lucky Dip (2015) you are invited to pick a folded card in a bowl, which when unfolded reveals itself to be either ‘lucky’ or ‘unlucky’. 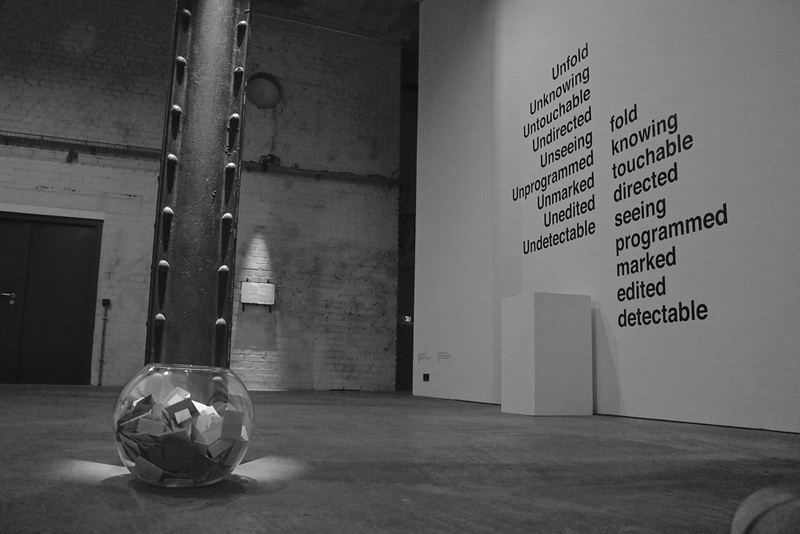 In the work Unmarked | marked (2015) the terms always, sometimes, never, no entry and needs discussion are picked at random to be stamped onto the hands of visitors. Terms that indicate sexual preferences and disclosures made by men on GPS enabled dating apps. In the context of Shout Festival in Birmingham the presence of these hand-stamps was actively commented on by a public who understood them; as the work moves into other territories the words will become more oblique, the viewer more curious as to the context they have been placed in. For this iteration of the exchange at HALLE 14 Richard’s text works occupy public space in the city of Leipzig, the billboard work Unseeing | seeing: Describe It visualizes the appearance of the HIV virus from a variety of individual perspectives, imagining it at one point looking like either pacman, macramé or, just, like any of us. Across the city; and in particular in the AIDS Hilfe Remembrance Garden, plaques have been installed on public benches as the series of works Unknowing | knowing each vocalizing the moment of diagnosis with deadpan humour. These works indicate an incessant presence; one that is routinely unseen and uncommented on. A subject without discussion becomes a stigma for all of us. Richards, a British artist born in 1974, takes a multidisciplinary approach linking art, natural science and social engagement. His work inhabits diverse forms including: graphics, installation and public art. For this residency he has explored site specific interventions in public space that articulate lived experience of HIV. During November artist Stuart Whipps has been making photographs of various components of the 1979 GT Mini, as well as continuing his research into historic paint colours at Longbridge. As part of the 1000th year anniversary celebrations of the city of Leipzig, WERK are pleased to have worked in partnership with Glenn Howells Architects to support Halle14 (Leipzig) with their artist exchange project between the sister cities of Leipzig, Birmingham and Lyon. Selected artists from each city have inquisitively and provocatively examined the parallels, disparities and nuances of the three cities. An exhibition at the Spinnerei galleries in Leipzig tilted ‘MANIFESTATIONS OF A FAR NEARNESS’ has been produced to conclude the project. The exhibition shows new works from the five artists involved in the project; Ian Richards, Sven Bergelt, Tom Castinel, Pale Male and Peggy Pehl. 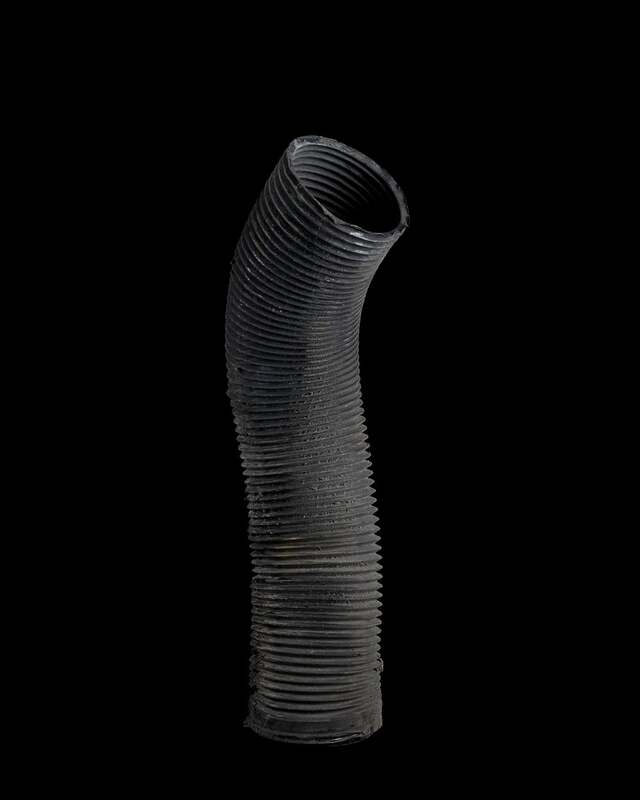 Their works deal with a range of subjects such as; urban renewal, life with HIV, the inventiveness concealed in everyday life and commonplace myths. An exciting opportunity has arisen for an ambitious, innovative and highly motivated individual to support the delivery of Longbridge Light Festival by WERK. 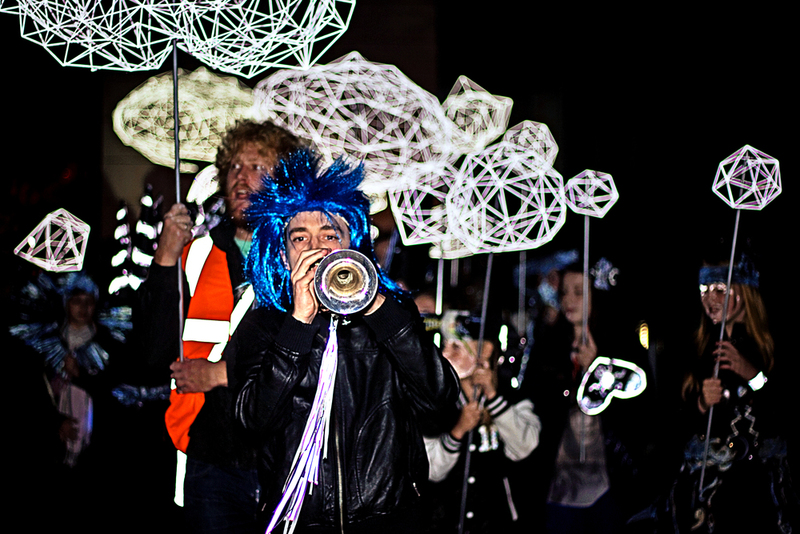 Celebrating the area’s unique past, present and future, Longbridge Light Festival (LLF) highlights a long-term contemporary art project by WERK embedded within one of the UK’s largest regeneration schemes. LLF 2016 builds upon the success of the inaugural festival in 2014, which attracted 5,500 people to experience new light based artwork created by 19 regional, national and internationally based artists, 34 collaborative festival fringe events and an international conference that explored best practice within the areas of art, architecture, urban design and regeneration. The Festival is presented in public space and multiple venues across Longbridge through valued partnership working. The Festival Producer will play a central role in enabling WERK to realise the LLF 2016 vision and its extended ongoing programme of work, working collaboratively with the existing team, alongside key stakeholders and local partnerships which include schools, community groups and local businesses. Candidates are not required to have previous experience within the arts, as long as they can demonstrate they are qualified for the role. To apply for this role please email info@WERK.org.uk for the application pack. WERK are delighted for LPAP artist-in-residence Stuart Whipps and the Longbridge residents and ex factory workers who have been supporting the artist with the mini restoration project. The mini is featured as part of British Art Show 8 #BAS8 opening this week at Leeds Art Gallery. Stuart Whipps is restoring the mini as part of his LPAP (Longbridge Public Art Project) long term residency. There are a number of mini restoration open days taking place please visit www.lpap.co.uk for more information. WERK are delighted to work in partnership with the British Art Show 8 and looking forward to seeing Longbridge mini tour over the next 15 months! Images courtesy of the artist: Stuart Whipps & Keith Woodfield (ex Longbridge car factory worker) working on the mini in The Cabin, Longbridge. The Kipper and the Corpse by Stuart Whipps is a Longbridge Public Art Project (LPAP) commissioned by WERK. Generously supported by The William A. Cadbury Charitable Trust, it is exhibited as part of British Art Show 8. Birmingham has something of a reputation for the destruction of its architectural heritage. From the sites of former Victorian, Edwardian and Brutalist buildings are increasingly springing new constructions that offer an improved and more glamorous vision for the city. Until, that is, these new constructions begin to tire too. Leipzig-based artist Sven Bergelt has been in residence in Birmingham for three months as part of the international Exchange@2015.le project, organised in conjunction with public art organisation WERK. His base has been, perhaps surprisingly, Birmingham’s Glenn Howells Architects. The firm is also the site of his exhibition ‘Future Worn Out New One’, the result of a sifting through of some of the layers of history, politics and planning that cover the city. Take, for instance, Bergelt’s large installation ‘Behind, the Paradise’, a large black-painted hoarding that stands ominously in the foyer of Glenn Howells Architects. Hoardings can be found on almost every street in Birmingham, temporarily obscuring both the demolition and construction of public spaces and private enterprises. This displaced hoarding has a physical and political presence. Turning its corner, however, reveals it has only two sides. In the open space a taxidermy crow is theatrically framed. Perched atop broken concrete aggregate posts sourced from the city’s former Longbridge car plant site, the bird metaphorically picks through fragments of the city’s architectural past. Whose paradise is this? One clear reference is to Paradise Forum, a now hoarded shopping arcade beneath John Madin’s Birmingham Central Library of 1974. After its demolition, Paradise Forum will become simply Paradise, a luxury commercial and retail area designed by Glenn Howells Architects. Madin’s library features too in a series of gentler works on paper by Bergelt. 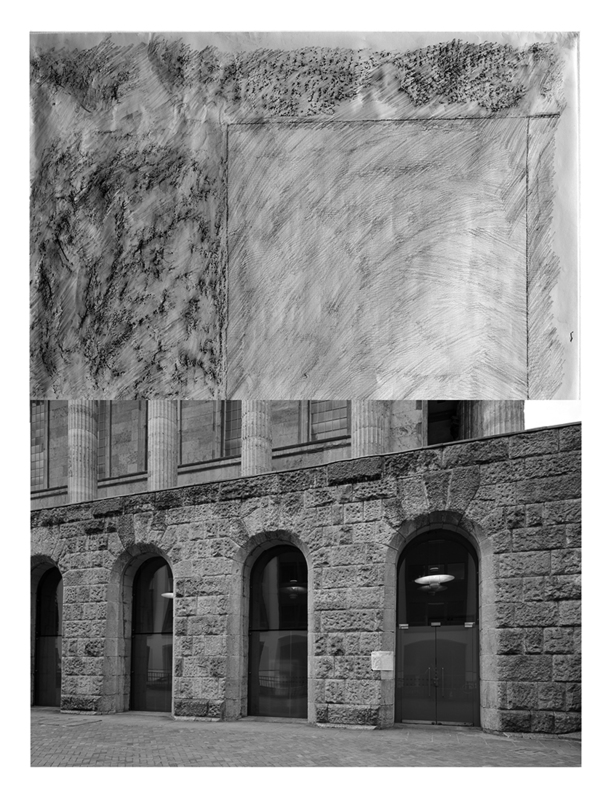 ‘Where is the Library’ is an index of its exterior architectural detailing made through surface-rubbing. In the preservation and archiving of fragments of the remaining building, Bergelt’s work takes a cyclical turn. Ninety-six of the artist’s ghost-like drawings are bound in a unique book which he hopes will form part of the new library’s collection. ‘Greetings from the Bulldozer’ pulls together aspects of the city’s wider heritage with historical German literature. In ‘The Rider on the White Horse’, a novella of 1888 by Theodor Storm, cats and children are buried within the construction of dykes for good luck. A line from Storm’s narrative is prominent within Bergelt’s installation. The remains of a mummified cat were similarly found within Birmingham’s nearby Curzon Street train station, built in 1838 and the proposed terminus for HS2. Through these parallel stories Bergelt aligns architectural creation with loss and with death. These strands run powerfully and starkly throughout each work. The final work of the exhibition is a replacement doormat for the foyer of Glenn Howells Architects upon which the exhibition’s title is stencilled. The work reminds us that, without care, many of the city’s buildings are ultimately as disposable as a doormat. The visual image of Birmingham is one of urgent and endless renewal. It is the perfect place to be an architect. Future Worn Out New One by Leipzig based artist Sven Bergelt was produced by WERK in partnership with Glenn Howells Architects, and sponsored by Argent and Zahoot. The exhibition is part of Exchange.le by HALLE14, an international residency exchange project between three sister cities Leipzig (HALLE14), Birmingham (WERK & Glenn Howells Architects) and Lyon (École nationale supérieure des beaux-arts de Lyon.) to celebrate the one thousand year anniversary of the city of Leipzig. Leipzig based artist Sven Bergelt has been in residence with Glenn Howells Architects and WERK for three months exploring the city of Birmingham. The artists work navigates Birmingham‘s past, present and future architectural styles as well as its pre-occupation with regenerating itself. Future Worn Out New One is a symbolic manifestation of the artists research and response to the city. The residency and exhibition is part of Exchange@2015.le project created by Leipzig based arts organisation HALLE 14 - Zentrum für zeitgenössische Kunst to celebrate the 1000 year birthday of the city of Leipzig. Exchange@2015.le is an artist exchange programme between three European sister cities of Leipzig HALLE14, Birmingham | WERK and Glenn Howells Architects, and Lyon | École nationale supérieure des beaux-arts de Lyon. Future Worn Out New One by Sven Bergelt will be exhibited at Exchange@2015.le group exhibition at HALLE14 contemporary art space in Leipzig later this year. The group exhibition will include work by other artists participating within the exchange programme Tom Castinel (Lyon) and Ian Richards (Birmingham). The artist has been in residence with Glenn Howells Architects (GHA) for the past couple of months exploring Birmingham's timeline of architectural styles and urban planning. The work will culminate within an exhibition and artist talk in late September at GHA. Watch this space, more news to follow soon! The international residency is part of Exchange.ie.created by HALLE 14 - Zentrum für zeitgenössische Kunst. Exchange.ie in partnership with Birmingham (WERK and Glenn Howells Architects) and Lyon (École nationale supérieure des beaux-arts de Lyon) is an artist exchange programme between three European cities. The project has been created by Halle14 to celebrate the 1000 year birthday of the city of Leipzig. Artists Tom Castinel (Lyon), Ian Richards (Birmingham) and Sven Bergelt (Leipzig) were selected by project partners in each city to take part in the exchange programme. The artists work developed within their international residency will culminate in a group exhibition at Halle14, Leipzig in November 2015. Cathy Wade is a long term artist-in-residence (since 2013) with Longbridge Public Art Project (LPAP). The artist has been exploring and developing multiple temporary and permanent artworks within the project that will unfold and be revealed over the next two years. Cathy Wade has been researching a map of the night sky that would have been present on the night that Lord Austin visited the old print works in Longbridge on the 4th of November 1905. From this research she is developing permanent work for Longbridge that celebrates how constellations of cause and effect are created by both nature and human actions. Herbert Austin undertook numerous exploratory rides around Birmingham in his Wolseley. On 4 November 1905, he found the derelict printing works owned by a financier, E A Olivieri. Friends came forward with financial help, and with additional invoice financing from Frank Kayser of Kayser, Ellison and Company, and William Harvey du Cros of the Dunlop Rubber Company enabled Austin to buy the site. WERK and Centro are delighted to announce that Juneau Projects have been selected to create work for the Platform 3 open call. The public artwork will be situated along the new Metro Birmingham city centre tram line in autumn 2015. For the Platform 3 cabinets we will be creating a new artwork looking at the very early history of the Birmingham area, taking influence from the stone age, bronze age and Anglo-Saxon period. The work will be interactive – a series of images on the platform cabinets will trigger animations on a phone or tablet when viewed through an augmented reality app. From earliest evidence of human activity in the stone age, through the bronze age and the Anglo Saxon era, objects were made by the people who inhabited the land that the city of Birmingham now occupies. We are interested in the human impulse to make things that improve our lives and surroundings, whether they are artworks or tools or a combination of both. The hand painted animations that appear via augmented reality on the platform cabinets will depict scenes of artefacts being made in the three time periods, from stone tools and bronze objects to Anglo-Saxon artefacts like those found in the Staffordshire Hoard. We feel that the relationship between the very earliest goods and artefacts, made during these three time periods have a relationship with Birmingham's industrial heritage and celebrate the ingenuity and creativity of the region, both in the past and today. Juneau Projects are Ben Sadler and Philip Duckworth. We have worked together since 2001and are based in Birmingham. Our work involves the use of a variety of media including painting, sculpture, music, animation and installation, often in collaborative and site specific ways. We have exhibited nationally and internationally with institutions such as PS1, New York; Eichigo-Tsumari Triennale, Japan; Tate Britain, London; and British Art Show 6. WERK and Centro would like to thank everyone for submitting proposals for Platform 3, it was a difficult decision for the panel and we hope to create more opportunities for artists in the future. Leipzig based artist Sven Bergelt has been in residence with Glenn Howells Architects for the past month as part of the Exchange.ie project created by Halle14, Leipzig. Exchange.ie in partnership with Birmingham (WERK and Glenn Howells Architects) and Lyon (École nationale supérieure des beaux-arts de Lyon) is an artist exchange programme between three European cities. The project has been created by Halle14 in celebration of the 1000 year birthday of the city of Leipzig. Artists Tom Castinel (Lyon), Ian Richards (Birmingham) and Sven Bergelt (Leipzig) were selected by project partners in each city to take part in the exchange programme. The artists work developed within their international residency will culminate in a group exhibition at Halle14, Leipzig in 2015. Sven Bergelt has been exploring the physicality of Birmingham. Birmingham is not a medeival town or city, it evolved from a trading post as a central hub for industry and transport links. Birmingham is a progressive organic city that continues to evolve and regenerate. The history of Birmingham in England spans 1400 years of growth, during which time it has evolved from a small 7th century Anglo Saxon hamlet on the edge of the Forest of Arden at the fringe of early Mercia to become a major city through a combination of immigration, innovation and civic pride that helped to bring about major social and economic reforms and to create the Industrial Revolution, inspiring the growth of similar cities across the world. The artist has been collecting rubbings of a cross section of buildings to archive Birmingham's timeline of architectural styles. For Longbridge Public Art Project artist Stuart Whipps is restoring a 1275GT Mini that was made at the Longbridge motor works in 1979. He is working with former employees of the factory and photographing all parts of the car and the process. Come and meet the artist and hear more about this exciting project. To mark the culmination of the artists three month residency with HALLE14, Ian Richards will be hosting an 'Open Studio' at HALLE14, Leipzig. The 'Open Studio' will be an exhibition of the research and work the artist has produced during his time in Leipzig. The artist will also be unveiling a large scale text work which will be displayed on billboards in the city of Leipzig. The Exchange.ie project has been initiated by Halle14 in partnership with WERK and Glenn Howells Architects. Exchange.ie is an artist residency exchange project between sister cities Lyon, Leipzig and Birmingham as part of the celebrations for Leipzig's 1000 year anniversary.